Evaluating wing players is difficult because there are many types: shooting specialists, athletic freaks, defensive specialists, slashers, and more. Very often, teams choose a player based on need as opposed to sheer talent. That said, here are my top prospects. To begin, Bradley Beal is strong in catch-and-shoot situations. According to Synergy Sports, Beal shot 37 percent and posted a PPP of 1.074, which ranked him among the top 40 college players last season. He can also show a pump-fake to attack the basket. In these possessions, Beal shot 57.1 percent while posting a PPP of 1.2, placing him in the top 15 percent of all college players — all because he knows how to use his shooting ability as a threat. There are a couple of important things to note about Beal and his pump-fake. He always catches the basketball ready to shoot, thus forcing the defense to close out hard on him. After the pump-fake, his first dribble is always a big one, getting separation from his man on the way to the rim. Beal attacks the help defense with full force, and because of his athletic ability, he can finish at rim. Beal runs into trouble when he attempts to shoot off the dribble. According to Synergy, he shot 25 percent off the dribble last season (on 52 attempts) with a PPP 0.615 (bottom 30 percent). Given his consistent motion, this problem is a result of poor shot selection rather than poor mechanics. Beal takes a lot of jump shots: 60.9 percent of his shots were jumpers. Thus, when he shoots off the dribble, he is settling when he should be driving to the basket. When a big switches onto him in the pick-and-roll, for example, he’ll often take a contested shot instead of trying to get to the rim. This is a matter of mind-set. If he can become more aggressive, his shooting percentage should rise. Beal’s shooting ability and tendency to attack the rim call to mind Eric Gordon’s game. Young players often struggle to apply their athletic gifts to defense. But Michael Kidd-Gilchrist already knows how to do that. 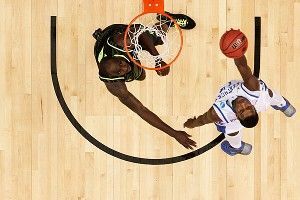 When defending in isolation situations, Kidd-Gilchrist held opponents to 25.5 percent shooting and a PPP of just 0.610, placing him in the top 30 percent among all college players. Even better, Kidd-Gilchrist forced turnovers 10.2 percent of the time in isolations. His length allows him to play a little farther back than most defenders, while still being able to contest shots. Combined with his natural athleticism, he hardly allows anyone to get past him, leading to dribble-jumpers, overdribbling, and turnovers. If there is one real standout weakness in Kidd-Gilchrist’s game, it’s his shooting. On jump shots, he shot 25.2 percent while posting a PPP of 0.626, placing him in the bottom 17 percent. He hangs on to the basketball too long. Most shooters like to let the ball fly out of their hands on the way up or at the top of the jump. Kidd-Gilchrist consistently lets his shot go a split second too late, often while he is on his way down. As a result, his shot is all arms as he flings the basketball at the rim. To his credit, Kidd-Gilchrist is aware of his weakness, settling for jump shots only 40 percent of the time, usually opting to take it to the rim. “An athletic player who can defend and is much better at attacking the rim” is a pretty good way to describe both Kidd-Gilchrist and Iguodala. Harrison Barnes is a player who is good to very good in many areas without a specific refined skill. His best asset might be his mid-range game, with which he had a lot of success this past season at North Carolina. “Medium”-range shots comprised 20.8 percent of Barnes’s shots, and he made 41.2 percent of them, posting a PPP of 0.824 (top 30 percent of all college players). Barnes knows his best spots, so he’ll use his dribble or set up his defender with a pump-fake (one that’s pretty good, but not at Beal’s level) to get where he wants. If he is closely guarded, he doesn’t panic. He uses his length and his touch to get his shot off, whether it is a step-back move or a shot where he is fading away. You’d think that he would be successful in pick-and-roll situations, using screens to get to his spots and pulling up for jump shots. But this is not the case. In the pick-and-roll, Barnes posted a PPP of 0.828, good for only the 64th percentile, despite shooting 40.9 percent. The reason for the low efficiency? Turnovers. Barnes turns the basketball over 13.8 percent of the time in pick-and-rolls. Barnes’s turnovers are a result of his decision making. When he comes off the screen, he seems to have predetermined where he will go instead of waiting to read the defense. This leads to many ill-advised pass attempts, sometimes passing up open shots or forcing jumpers. This is a little worrisome for me, because NBA defenders will be quicker and smarter. In addition to their mutual affinity for the mid-range jumper, they have similar shooting styles in which they are neither set nor leaning. Additionally, neither is a strong ball handler and both have high turnover rates. Phelps or Lochte: Who You Got?